It's definitely a temporary fix. 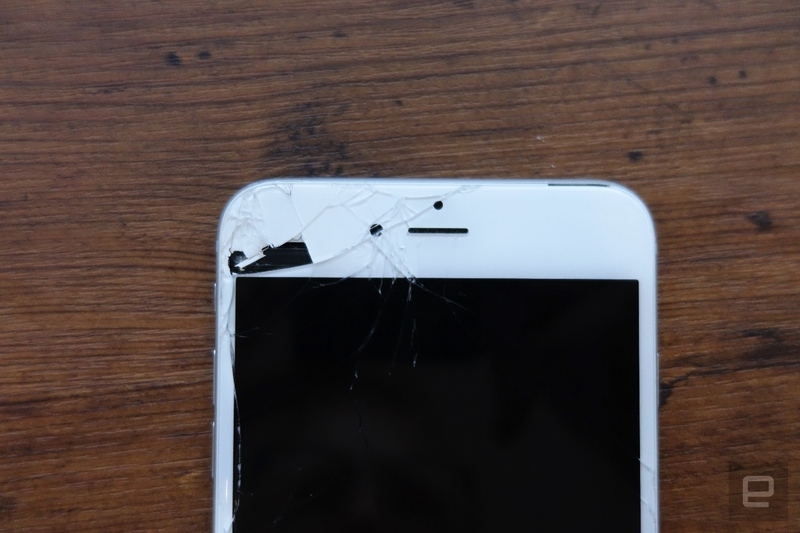 After a BBQ last Sunday (there may have been alcohol), I dropped my phone. Multiple times. And I wasn't lucky. Although my iPhone 6 Plus has suffered tiny hairline cracks in two of the corners, this time the drops were critical hits resulting in a spiderweb of substantial cracks, the majority of them around the bottom right corner -- you know, where your thumb always is. Typing on it meant risking a tiny shard or two cutting into my thumb, and even when I avoided that, those cracks still irritated my fingertips. Touch functions were also impaired. Google Maps was not cooperating. While the brunt of the damage was in the lower corner, the drop had also crippled my front-facing camera. Perhaps the camera leaves the screen structurally weaker there, or was this the universe's way of saying I'd taken one too many self-portraits? And yet the next day was Monday, a work day. The Apple Store was fully booked. I needed a miracle. Or at least a cheap short-term solution. 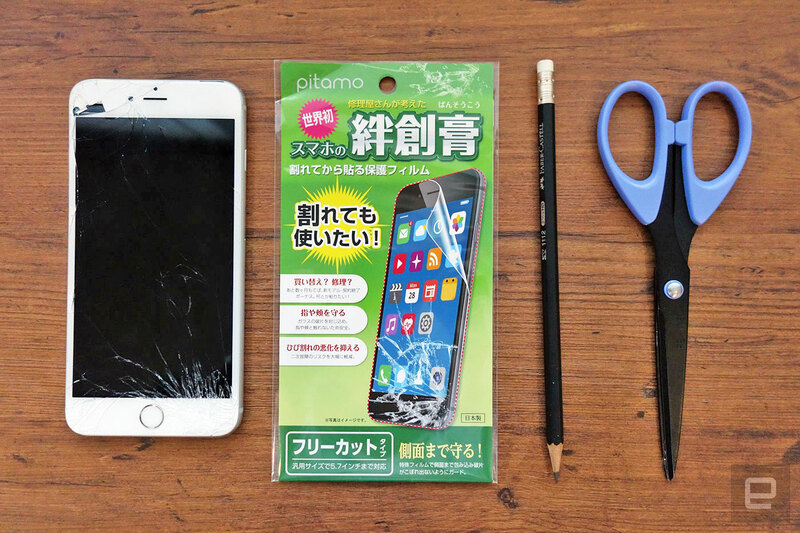 I turned to Pitamo's smartphone bansouko ("Band-Aid"), a cut-it-yourself three-layer screen for broken smartphones. It promises to contain any more shards of doom, stop the cracks from getting worse, and keep your phone useable -- all for under 10 bucks. What could go wrong? I heard about the smartphone "band-aid" from my colleagues at Engadget Japan. None of them had tried it out -- possibly because they were sober enough to not drop their (caseless) iPhone multiple times. I went to one of Tokyo's many giant electronics stores to make a purchase. I picked it up and grimaced. "Cut to size," it said at the bottom of the packaging. I was going to be dependent on my cutting and tracing skills for this to work even remotely well. There's a laborious nine-minute, Japanese-language tutorial on how to apply it, but the pictures included with the cover explain everything, even if you have no kanji-reading skills. You trace the outline of your phone (and because you cut it yourself, you can use it on any smartphone model). Then you cut out your phone-shaped sticker. Carefully. The guide then suggests you use a toothbrush to gently remove any excess phone screen shards. Except my thumb had done that for me already. The base layer of this particular cover is made of a softer material that keeps what's left of your screen in place and intact. It also has a bit of flexibility to it and feels like it's tightly bound to my phone. The topmost layer has a low-reflective satiny finish which the maker says should resist fingerprints more easily -- though that's really the least of my problems. When it finally went on, it felt good. Peeling a "fresh" cover off an out-of-box smartphone is the primary reason most tech writers get out of the bed in the morning. This may be the reverse of that, but it feels just as satisfying. However, the struggle wasn't over yet. I then had to grab a craft knife and cut away and areas that needed access to the outer elements: the home button, speaker and front-facing camera. The scrape of a craft knife on my iPhone made me queasy -- especially on the home button -- but I pushed through. 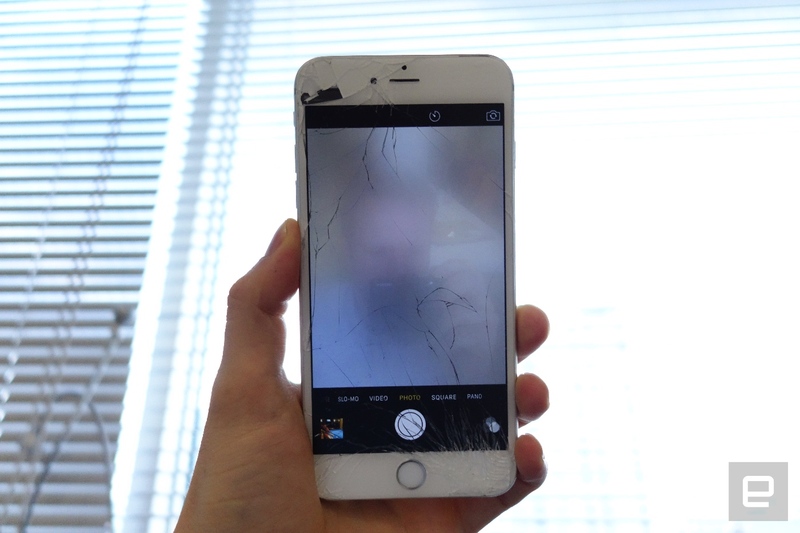 Still, the glass-based damage to the front camera (coupled with multiple layers of plastic) means I'm going to have to learn how to take selfies with the iPhone's main camera. Is my screen perfect again? God, no. Look at it! But the smartphone cover is helping. I can safely run my fingertips over the screen; it's at least useable again. My iPhone will live another day to play games, get me places on Maps, and help me rant on Facebook. Fortunately, I had paid extra for Apple Care, and so I'll be taking my phone in later next week to get it replaced. This "Band-Aid" cover is very much a short-term solution, but by that criteria, it works.